In every environment it is important to make sure that you have backed up and can recover the data that you need if a failure occurs. No matter whether it is an enterprise, corporate, or branch office backup should be performed on regular basis. Luckily backups in SharePoint are one of basic features and this is well documented on MSDN sites. I will not provide full scenario how to backup your site collection. I will only mention that this is possible from SharePoint Central Administration GUI and PowerShell. The second part of this article refers to SharePoint archiving. Well, this part is not covered by any component yet, but there are several approaches. The easiest one is to change site collection settings to read-only mode or even close it which is decried in manage site collection disposition article. There is great article on how can you tweak some SharePoint settings to get “archive” state of your site collection. 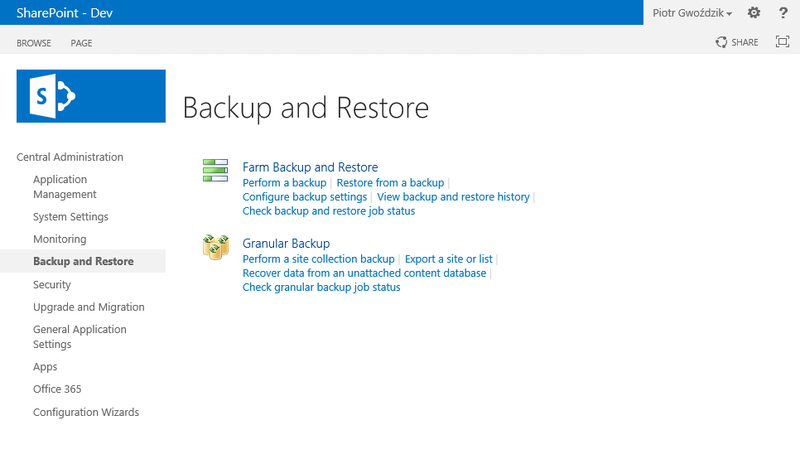 Another solution is to move your site collection to special archiving place using backups and restore in target area. This might be special, separate web application that is already prepared for storing not used site collections. This is rather manual work and involves lot of investigation and well documented procedures that depend on company. The last one is to develop custom solution based on workflow or other part. This is the most risky solution, but can deliver the best result for your organization.